As this blog proves, I'm clearly one to re-wear a lot of my clothes. Now, being pregnant, this proves to be a bigger challenge since things only fit for a short period of time. Imagine my delight when I pulled on this skirt and found that I can still "get away" with wearing it. Sure I had to be creative with how the skirt fits around my waist (ahem, unzipped) but, for this day, it worked. I love this skirt! You definitely made it work for maternity! Yay for unzipped skirts because this one looks so cute on you! 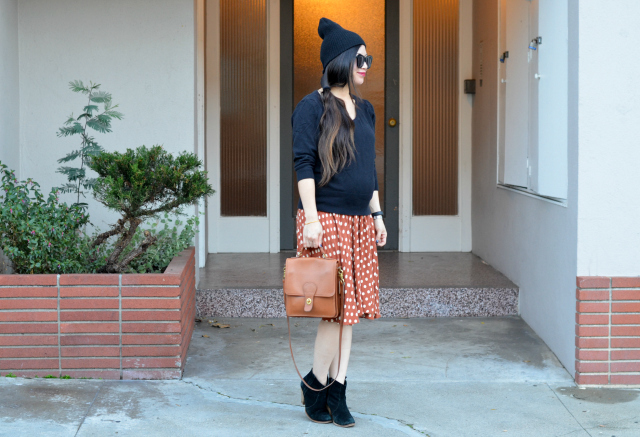 You are rockin' your pregnancy style! Looks so great paired with your sweater. Great print on the skirt. 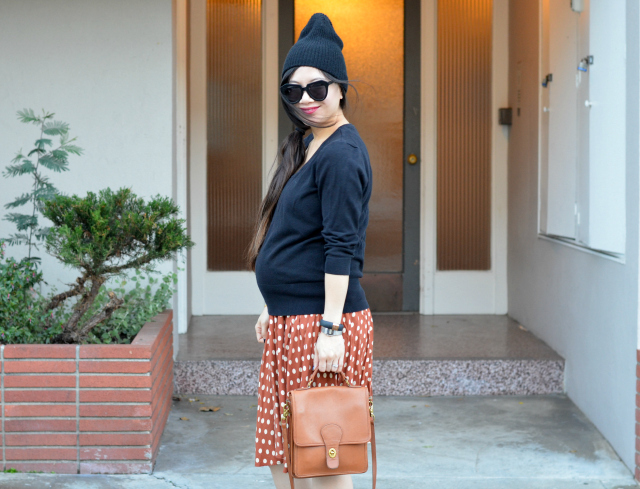 That's so awesome that you can still wear non maternity wear! I am not preggos and have worn my skirt unzipped only because I have gotten fat. Looking perfect as usual. You look amazing in these photos. 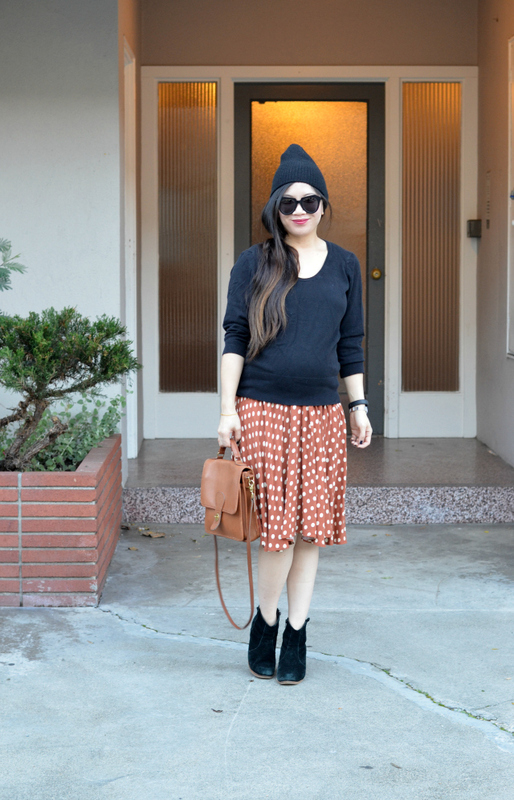 l love your polka dot skirt. Love your ankle boots. You are beautiful and fashionable. Fabulous post! 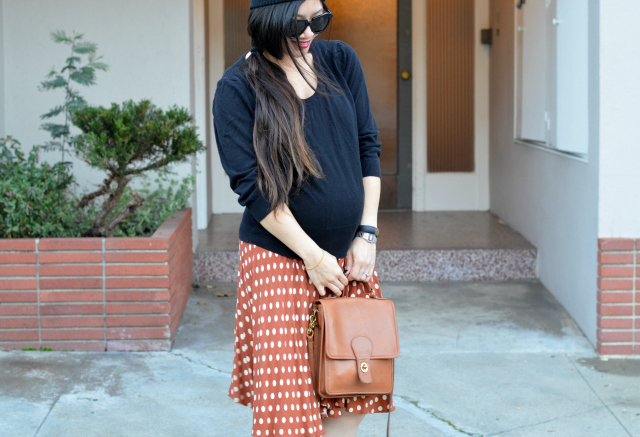 Love that little chic bag! So nice! Love your outfit. You look gorgeous. Adoring the look on you. That skirt is awesome, girl. you would never know it was unzipped! hahaha looks great Nancy! 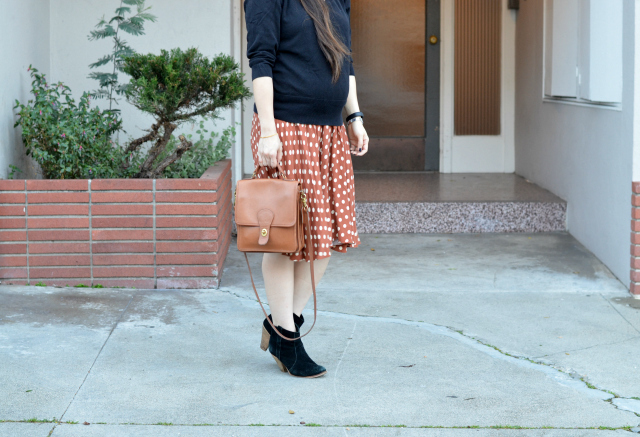 Oh I love this tawny dot skirt gounded by the black! You do indeed pull this off! Glad to see you bump is growing , day by day! Sending hugs to the two of you!